Angeline graduated from Shanghai International Studies University. She has around 7 years of experience teaching all levels of Chinese to international students, including teaching Chinese culture and oral speaking. 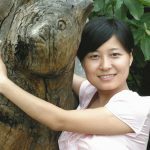 She is currently teaching online at TouchChinese for Chinese learners. Angeline is also a recorder for the movies of TouchChinese. She likes to help foreigners learn Chinese using movies. She is skilled at helping kids study Chinese in her unique teaching style. Learning Chinese is a long journey, but if you follow her, you will feel wonderful and happy along the trip.